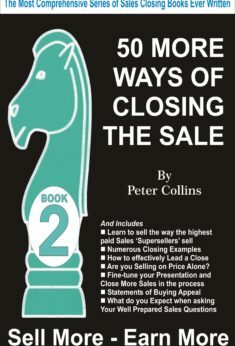 First published in 1993, Over 50 Ways of Closing the Sale is acclaimed as one of the most comprehensive sales manuals ever written. The 50 closing styles together with more than a further 180 closing hints, sales and role play’s makes this one of the true must read selling books. Today, closing on the first call is what most desire, but few accomplish. This book has been specifically written to re-teach that sales competence (together with the necessary foundational under-standing), lost to all but the professional seller – and these days, only found among the top 1% of all income earners. This is the first 50 Ways Closing in a series of seven books. Over 50 Ways of Closing the Sale is acclaimed as one of the most comprehensive sales manuals ever written. The 50 closing styles together with more than a further 180 closing hints, sales and 23 role play’s makes this one of the true must read selling books. 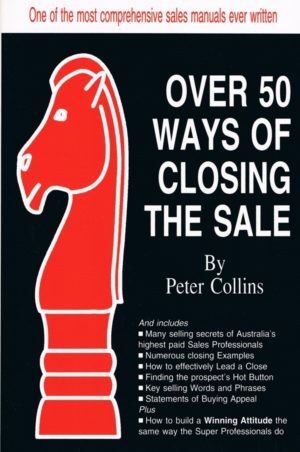 Over 50 Ways of Closing the Sale is the very first closing book written by Peter Collins (first in 1994) and was based on the Audio Tape Series produced in 1983. In the 1950’s and 1960’s, closing the sale on the first call was what most professional sellers worked at, and achieved. Today, closing on the first call is what most desire, but few accomplish. 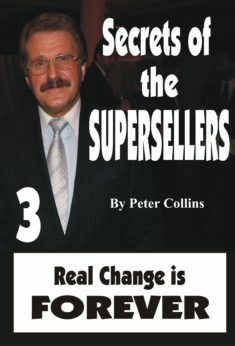 This book has been specifically written to re-teach that sales competence (together with the necessary foundational under-standing), lost to all but the professional seller – and these days, only found among the top 1% of all income earners. 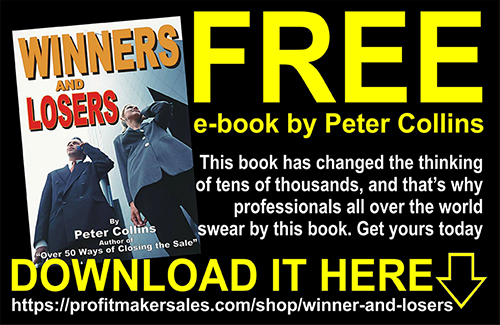 More about the book ‘Over 50 Ways of Closing the Sale’ . . . This book is designed to answer the concerns of both groups. 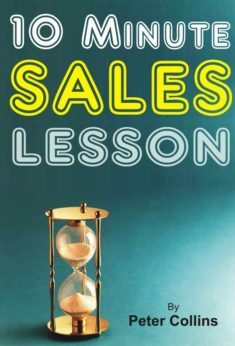 Written by a hands-on professional with just under 30 years (at the time the book was written – and over 50 years today) of all manner of direct sales and management experience, and holder of a number National and International Sales Records, which include World Records for the Best Closing Ratio, over two successive 12 month periods – 86% then 92% on the first call. Over 50 Ways of Closing the Sale was was published as a 224 page A5 sized paperback. It may be a smaller business book compared to some others, yet it’s a book crammed with so much information it’s worth it’s weight in gold – heaps of salespeople attest to that one fact – others tell how it’s turned their sales around , and for the better. If you want more proof of this just read through the index below to get an idea of how much information has been crammed into this unique publication. Do people buy on Needs or Wants? What about the Closers Instinct?